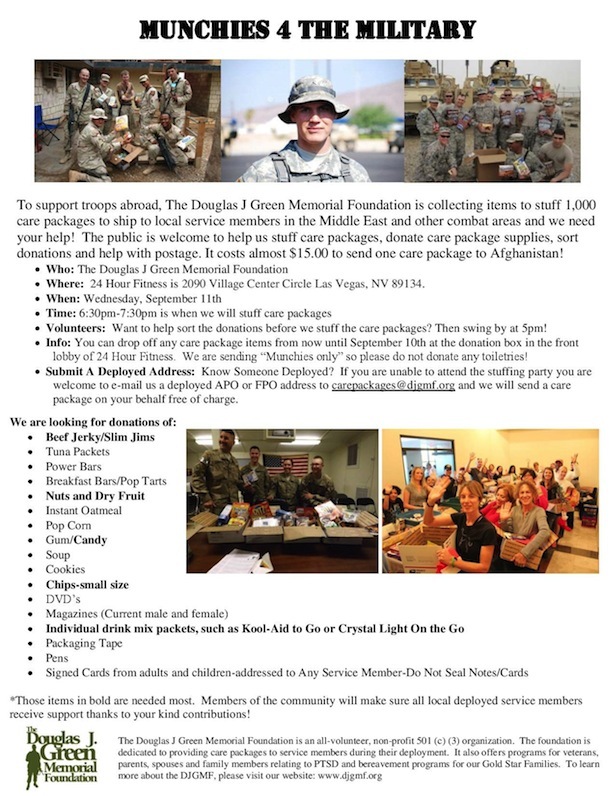 September 11th is coming up fast and we’re holding three events to raise money to ship out 1,000 care packages to local service members in the Middle East. Listed below, The Never Forget Bootcamp aims to raise food and goods and The 24 Hour Freedom Ride aims to raise money for the care packages. 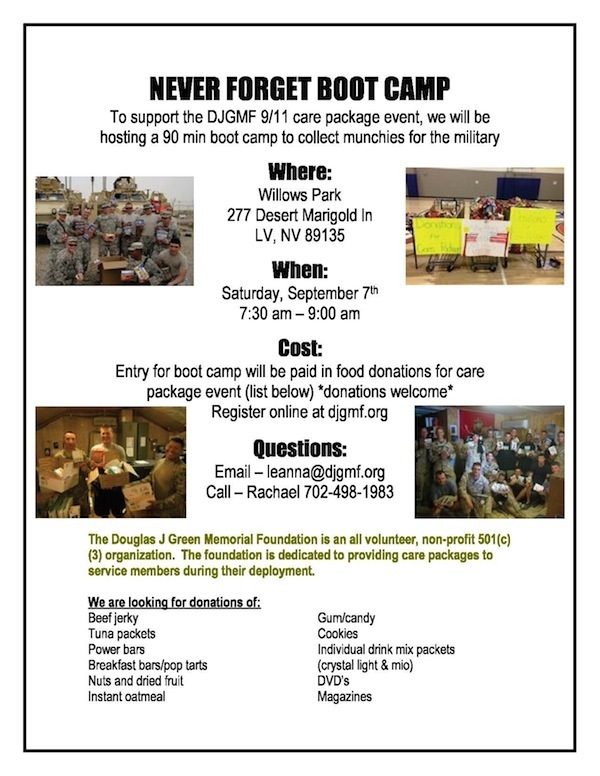 These two events lead to our 2nd Munchies for the Military Event where we would love your help collecting, packaging and sorting donations to be shipped out. In order to hit our goal of 1,000 care packages, we need your help. It’s almost $15 to ship out a single care package, therefore we need to raise $15,000 to meet our goal. 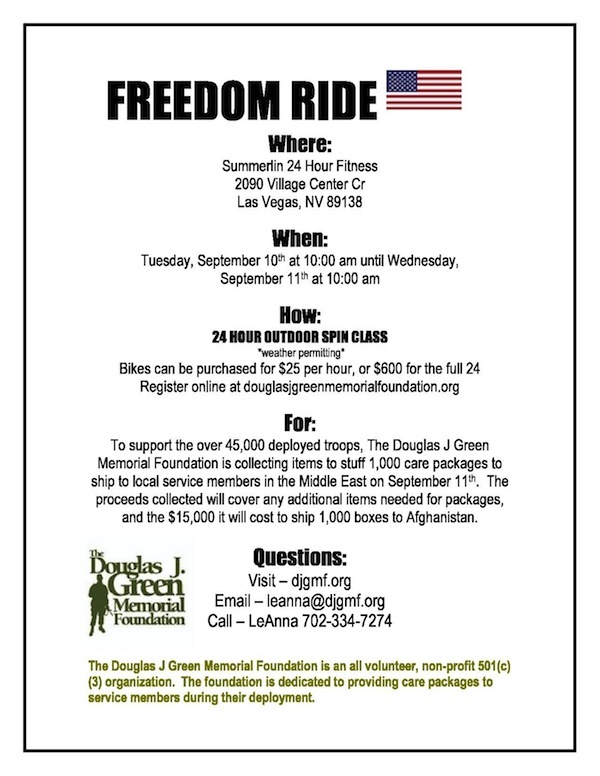 If you could come out to our Freedom Ride event (listed below), and purchase for a single hour slot on a bicycle, that would be much appreciated. It’s $25 per hour and some of us plan to ride for 24 hours straight! This is an event that hasn’t been done before and will be outside of 24 Hour Fitness in Summerlin off Village Center Circle. If you’re interested in signing up, read the instructions below. If you want more information, continue scrolling down where we have flyers for each event leading up to our 9/11 Munchies for the Military Event. 2. Complete the Registration Form. Please fill out this form, be sure to specify the hour you would like to ride, as we have a limited number of bikes and would like to accommodate everyone. Your privacy is important to us, and any information given will only be used to remind you of future DJGMF events. Register Here: Just name and email, we’ll send you updates about the event via email. Contact leanna@djgmf.org with any questions.